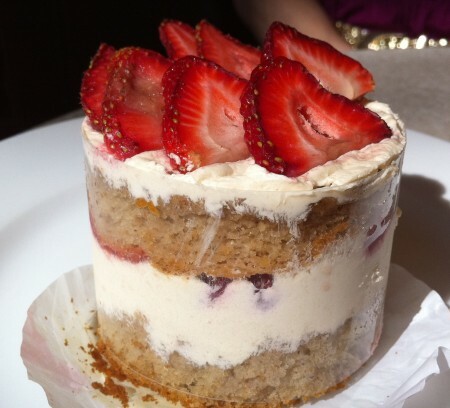 The Strawberry Shortcake was nothing short of delightful (even though we had an ugly strawberry on top). The rice syrup worked brilliantly as a substitute for refined sugars and the fresh strawberries gave a perfect balance of natural flavors. The Tiramisu was not nearly as exciting in my book. It was fine for a plain, sweet cake, but that’s all it was… sweet. Where was the flavor? The kick of coffee?? The spike of alcohol? The dash of salt? 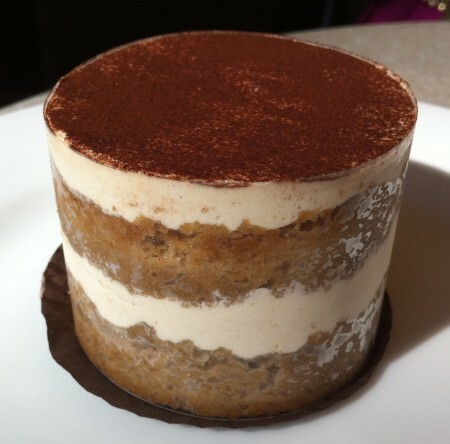 Boo- while pleasantly sweet, I found this rendition of a Tiramisu to be bland and flavorless. Overall, we were impressed by the healthy, macrobiotic feet that M Cafe had pulled off with their cakes. Furthermore, we didn’t feel “gross” after eating desserts that were made from wholesome ingredients. A nice win win all around. For more information on M Cafe, click here.